Have you ever read Malcolm Gladwell’s Outliers? In that book, he makes the case that 10,000 hours of practice are needed for mastery in many art forms and skills. He mentions the success of Bill Gates has deep roots in early access to computer technology. He references the 1,200 live performances the Beetles gave in Germany prior to their fame. He makes the point that mastery requires practice and opportunity to hone skills. Since the Outliers book was published some detractors have commented that really 25,000 hours are needed. Or they say that luck and nimble thinking is far more important than years of practice. I think we need both. I think we must devote hour upon hour to our chosen art, but we must be willing to spin on a dime and use our skill in a new way when circumstance or opportunity presents itself. Which brings me back to childhood. When I was in first grade I spent every recess drawing on the brick wall at Washington Elementary. I drew on this on this playground. It is a lovely thing to draw or paint upon the playground and recently I did such work with the children of Murch Elementary. My son Isaac is a first grader at Murch; but I have been helping that school with auction art for 9 years. Each year, I go into classes and ask the children what would they like to create for the auction project. We talk about Return on Investment. How much will the materials cost and how much can we make on the project. We talk about which subjects would they like to paint, that their parents would want to buy. IE, though it may be fun to paint Pokemon, will many parents want to buy that? 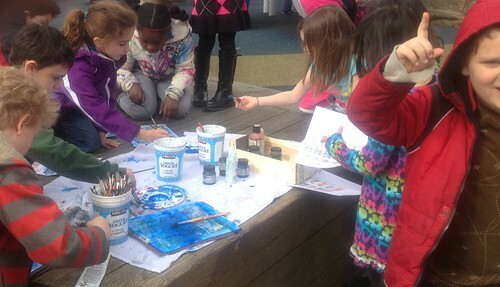 The children create a list of about ten topics that they would be interested in painting about. Then all heads go down as we do a blind vote. We narrow it down to three choices, everyone looks up and we talk about the three topics and do a second blind vote. The winning topic will be the subject of the painting. This year I completed this process with four classes at Murch Elementary. I have partnered with the teacher Ms. Mathur for several years on such projects. She is always such a joy to work with. This year Ms. Mathur’s class wanted to focus on the coral reef and tropical fish. 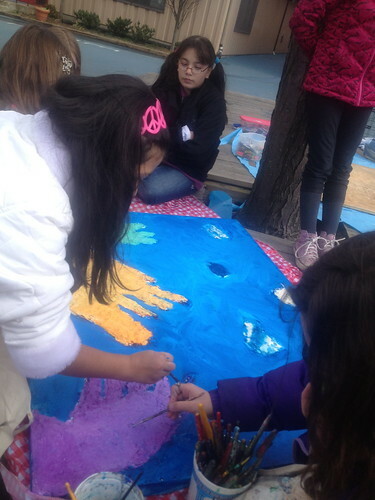 They wanted to create the tropical reef using a 3-d effect they were taught last year by art teacher Miriam Cutelis. 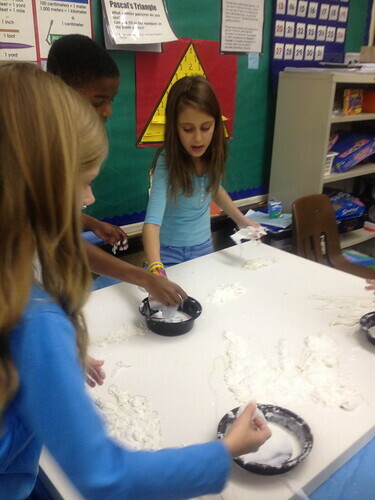 The students had such fun immersing their hands in glue and sculpting the 3-d elements. 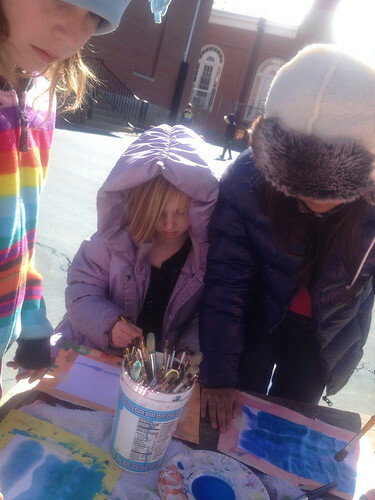 Then they worked at their desks creating fish paintings. I also was able to work with Ms. Hsu again this year and she was excited about the topic. Her class decided to focus on the rain forest. They painted the many small animals and insects that populate the canopy and painted the trees using masking off and sponge painting. 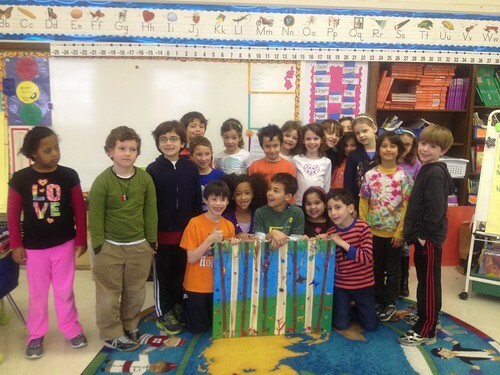 The students loved pulling the making tape of the tree trunks and revealing the painting. 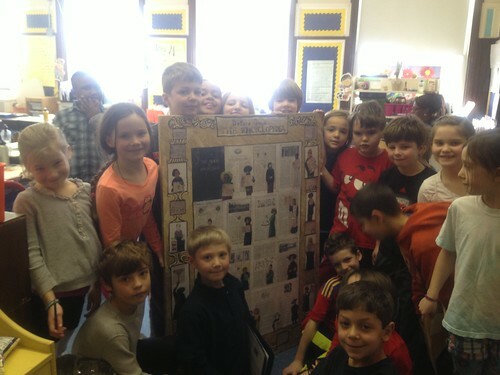 Ms. Stephen’s class chose a very elaborate project with the support of their teacher. 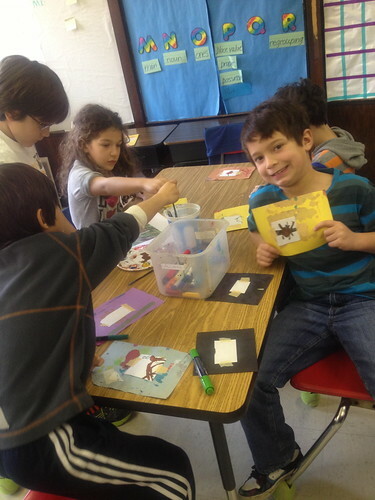 The students wanted to create a project that incorporated Habitats, Native American’s, Solids and Liquids, Weather, Insects, Simple Machines, Biographies and the elements of a book. Where do all those topics meet? In an encyclopedia! 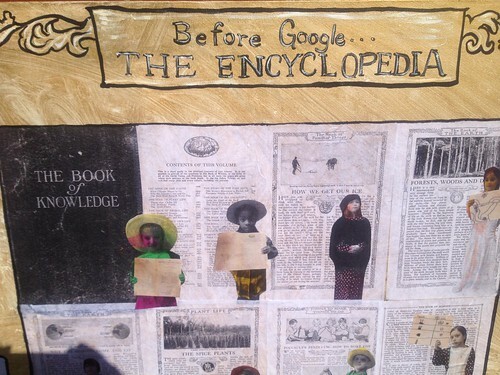 So we did a piece of art based upon an encyclopedia from 1920s. 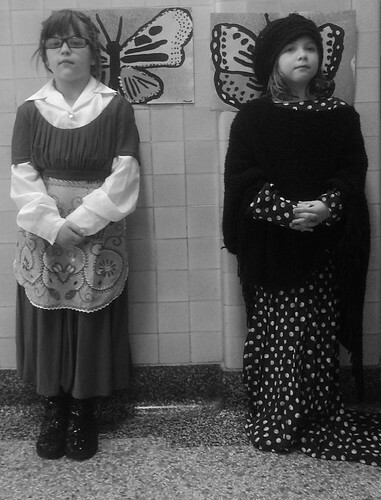 The first step was to have a dress up day in period costumes. Room mother Kim Webster did an amazing job in helping the children into the many layers of dress that would have been appropriate for an encyclopedia at the turn of the century. Each child posed in a dignified manner as we took each picture. Then those pictures were printed in black and white onto rice paper and the children hand colored them in the classroom. My son Isaac is in this class so I volunteered my services to Ms. Werner early on. 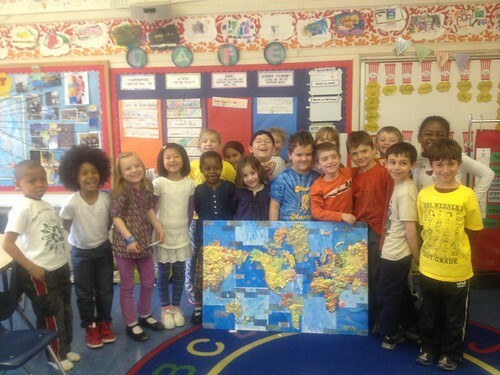 These first graders had a novel idea. They wanted to focus on currency from around the world. So children brought in coins from many nations and we did coin rubbings on rice paper with crayons. Then I cut out a world map and handed each working group a continent. We mounted clay machines around the classroom that extruded thin layers of polymer clay. 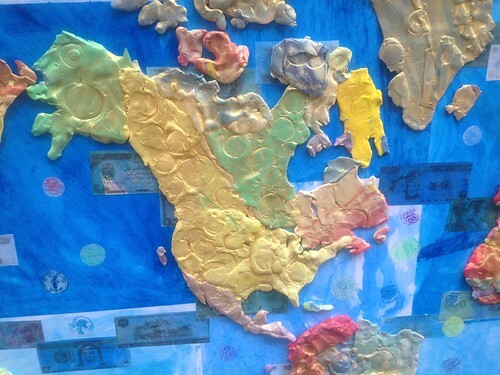 Each group was given a wide array of color to cover their continents in Sculpey clay. Then they pressed coins into the finished world to create another series of coin impressions. To create continuity of form and to reemphasize the children’s focus on currency, I dusted the work with a gold powder. Then I baked each clay continent in my home oven. When I do auction projects with classes, I try not to take away too much instructional time. As some of these projects were quite elaborate, we finished second steps on the playground on a relatively pretty day. 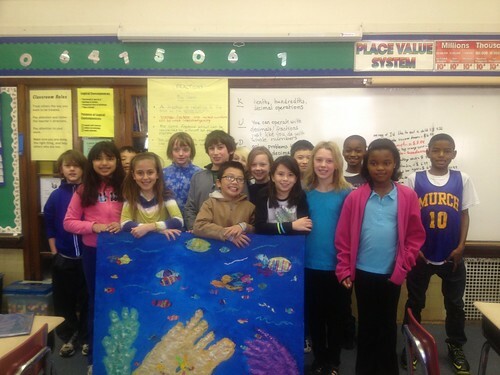 Ms. Mathur’s class needed to paint the coral reef. Mr. Werner’s class needed to paint an ocean of paper blue and the paper currency waves. Ms. Stephens’s class needed to draw pictures about their different focus areas. The playground is a great place for making new friends. Many children came over while we were painting. They were from other classes but they wanted to paint too. I did not turn them away. 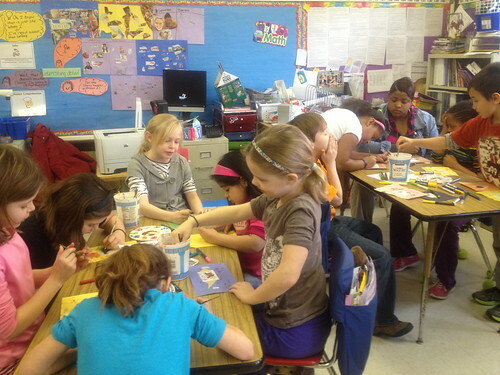 They joined in the effort and freely gave their time and their joy of art and all of its possibilities. 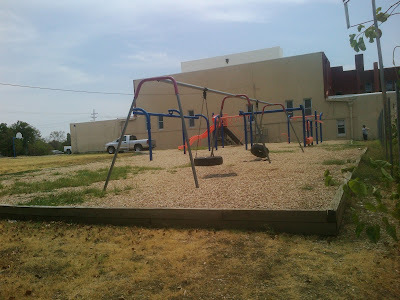 I know recess is designed as a time to run and play. It is a time to focus on health and freedom from the rigors of academia and memorization. But when a child draws on the playground, the mind can run free as well. These stolen hours in childhood accumulate over the years to ten thousand hours and mastery of the form. So when the day comes that these children can use their skills to help others and change the world, they will be ready. Thank you! The kids did a great job! This is beautiful (as usual) Regina! In addition, you have struck a chord with me that makes me consider Health/Patient Advocates like yourself as Outliers! Your deep, practiced experience is what results in the mastery, and thjat's what makes you and others like you so special....and so valuable to the rest of us to learn from.